There are some general rules of thumb which you can follow when planting bulbs. The very familiar garden species with quite large bulbs, such as tulips and daffodils, need a planting hole which is 3 times the height of the bulb e.g. if your bulb is 3 inches high you will need a 9 inch deep hole. 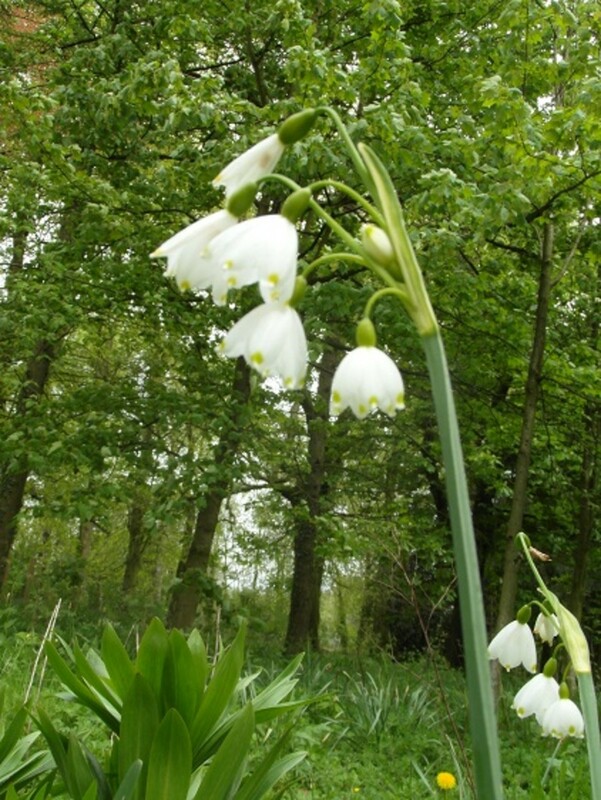 Smaller garden species such a bluebells and snowdrops need a planting hole twice the depth of the bulb. 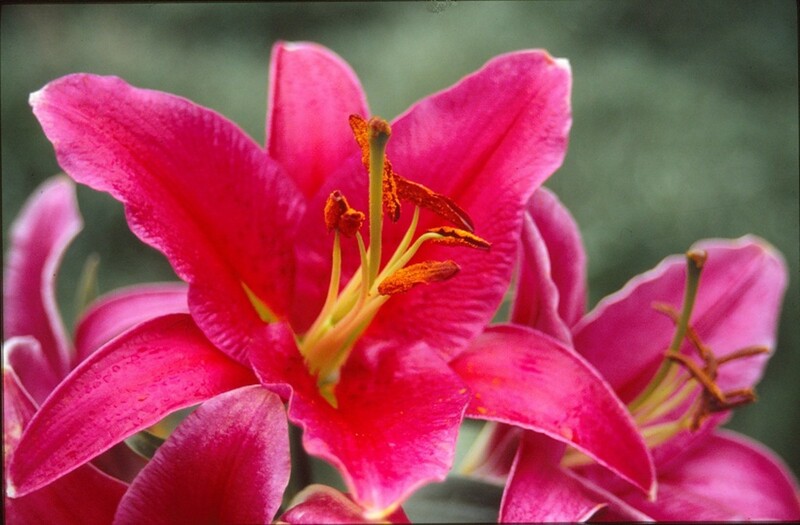 The half hardy and houseplant bulbs such as forest lilies usually need planting in a shallow hole with part of the bulb showing above the compost. 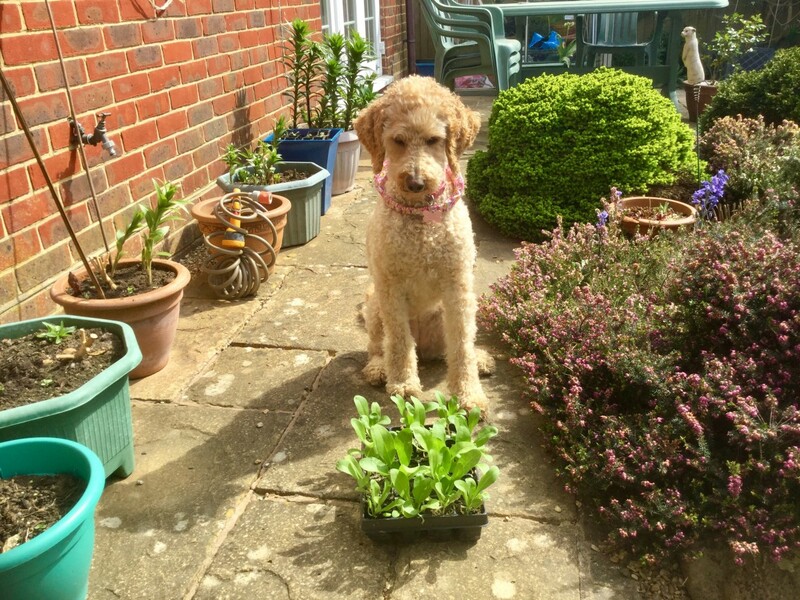 There are exceptions to the rules and species which will do ok if you follow the basic rule, but may perform better planted at a different depth, so specific planting instructions for a variety of flowers are included below. This article covers the true bulbs which mostly look a bit like onions, which are bulbs too. 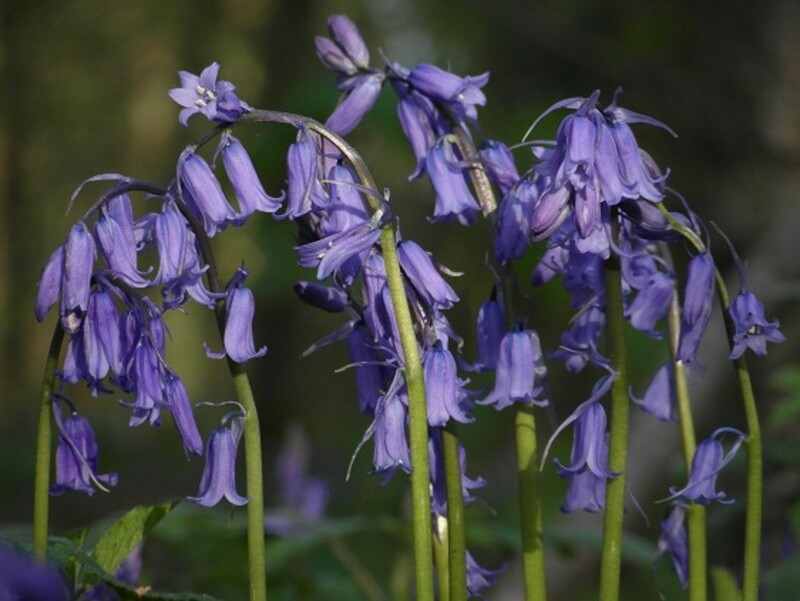 Therefore you won't find crocuses (corms) winter aconites (tubers) or agapanthus (rhizomes) amongst the plants listed below. Depth - Cover with soil to 3 x the height of the bulb. 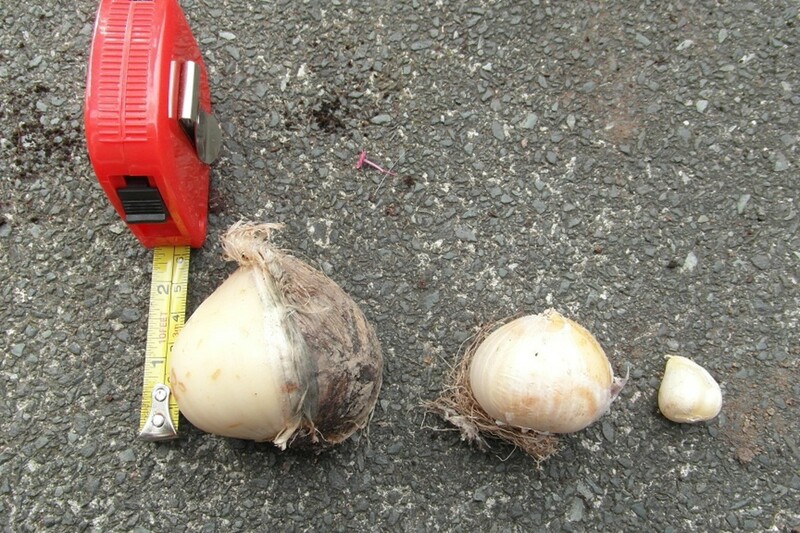 You can see in the photo how much the size of the bulbs varies between species. 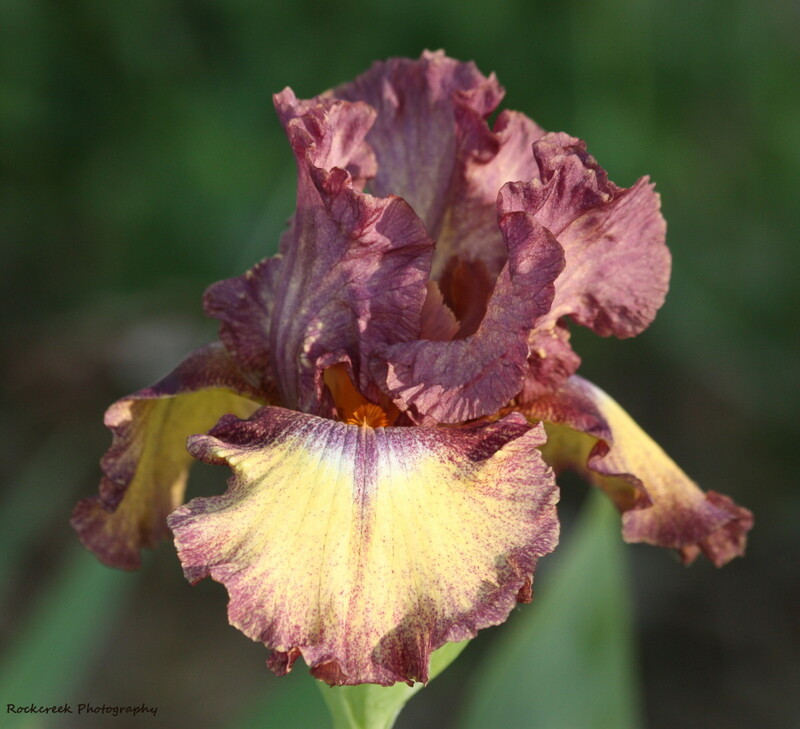 Although bulb size can be an indication of flower size, it isn't necessarily a good indicator of the height of the plant. 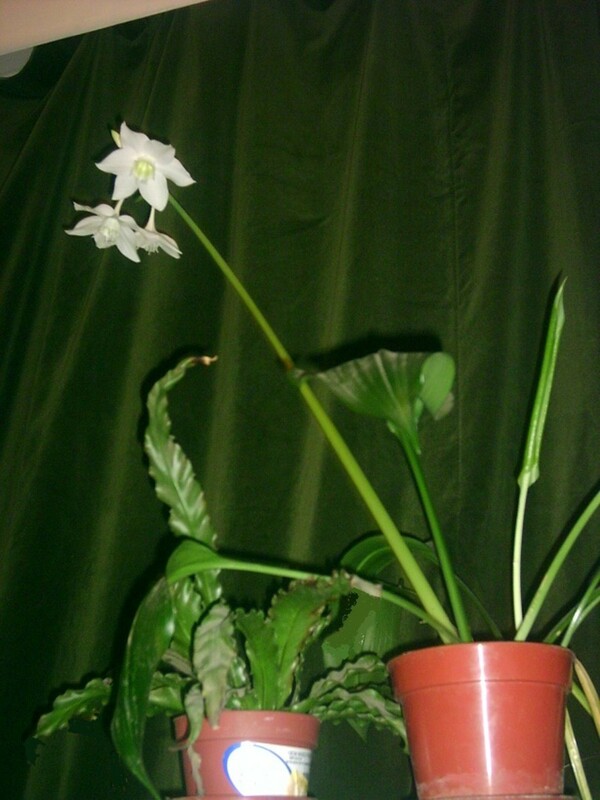 For example the A. sphaerocephalon with the small bulb grow up to 24" high whereas the medium sized bulb A.christophi grow up to 18" high. 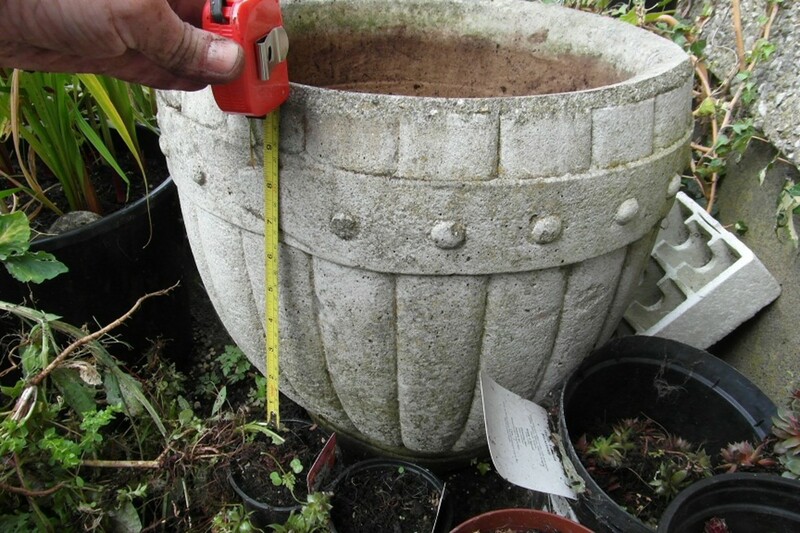 1) Measure your bulb and work out how deep it needs planting. 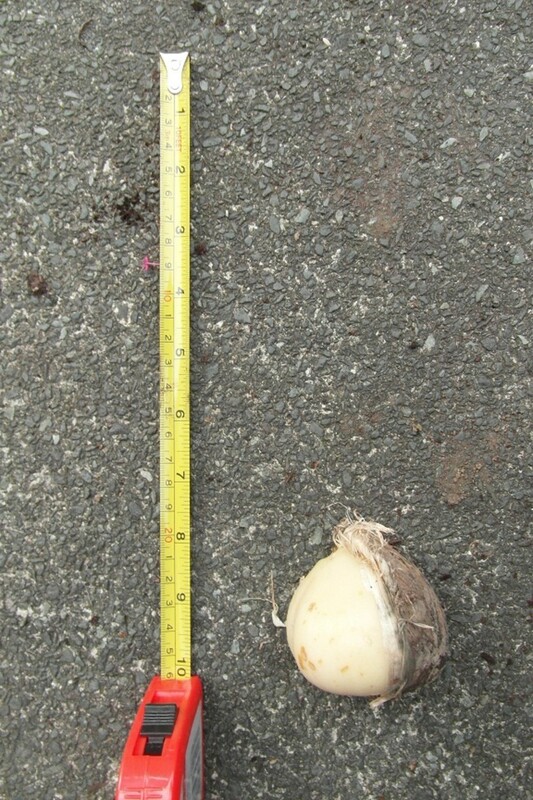 If like me you're not very good at visualising planting depths it's quite surprising when you get a tape measure out to see just how deep a large allium bulb needs to be planted. The Allium gigantuem bulb I used is over 2 1/4 inches long and covering it with compost or soil 3 times its depth, mean that the base of the bulb should be about 10" from the surface. 2a) If planting your bulbs straight into the ground dig a nice flat bottomed (rather than V shaped) hole of the correct depth for them. For extra drainage it is worth putting a layer of compost mixed with sharp sand at the bottom of the hole. 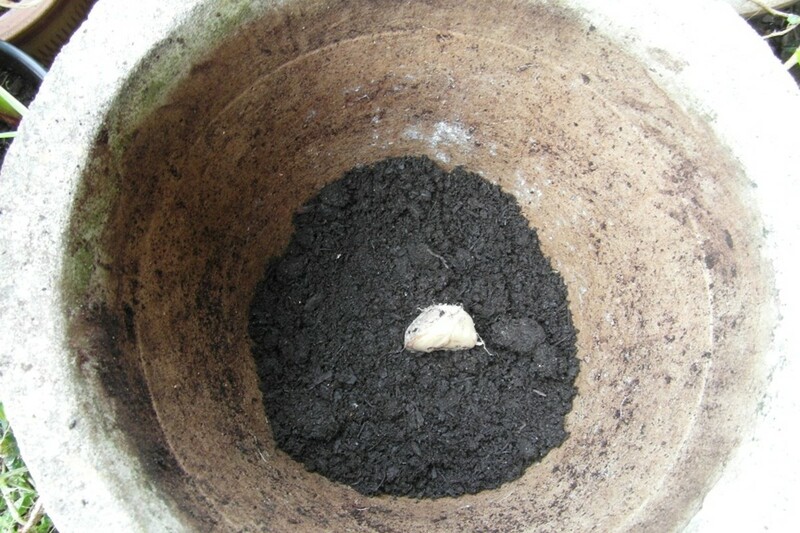 2b) If planting in a tub allow for drainage crocks at the bottom, a layer of compost for the bulb to sit on and a bit of space to the rim of the tub to work out what size pot you need. For the A giganteum I needed a pot at least 12" deep. In a shallower pot the bulb would flower well the first year but would be less likely to flower well in subsequent years. 3) If layering the area or pot with other smaller bulbs work out their planting depth. Just one big allium on it's own would be a waste of a pot, so I added a layer of the A. sphaerocephalon and some scilla nearer the top of the pot. These small bulbs only needed 2" of compost between their base and the soil surface. 4) Cover your bulbs with compost or soil. Don't firm it down. 5) If you've planted straight into the ground it is worth putting a marker in to remind you where they are. Belladonna lily (Amaryllis) these are not the Christmas houseplant ones. Note - They do much better if you can get them 'in the green' rather than as dry bulbs. 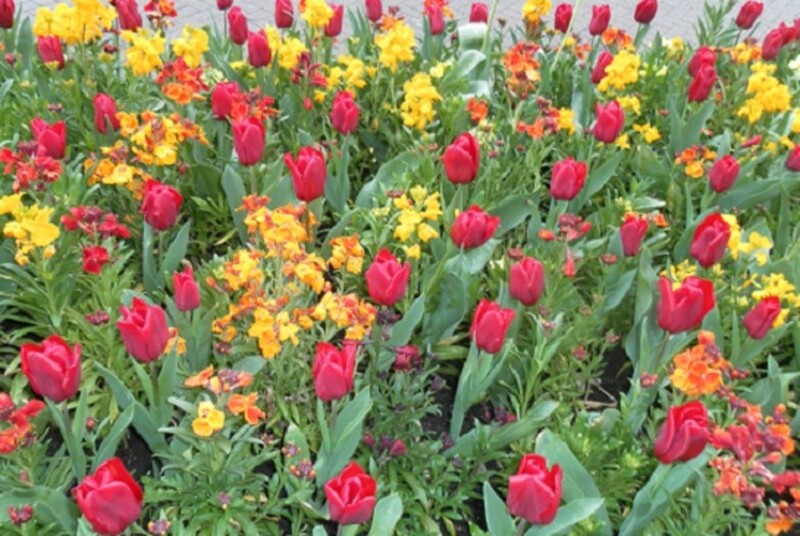 Note - if you are planting the large varieties as part of a bedding display and want to treat them as annuals, throwing the bulbs away after flowering, you could plant then 3 inches deep. Depth – bulb tip level with the surface. Depth – bulb neck above the compost. 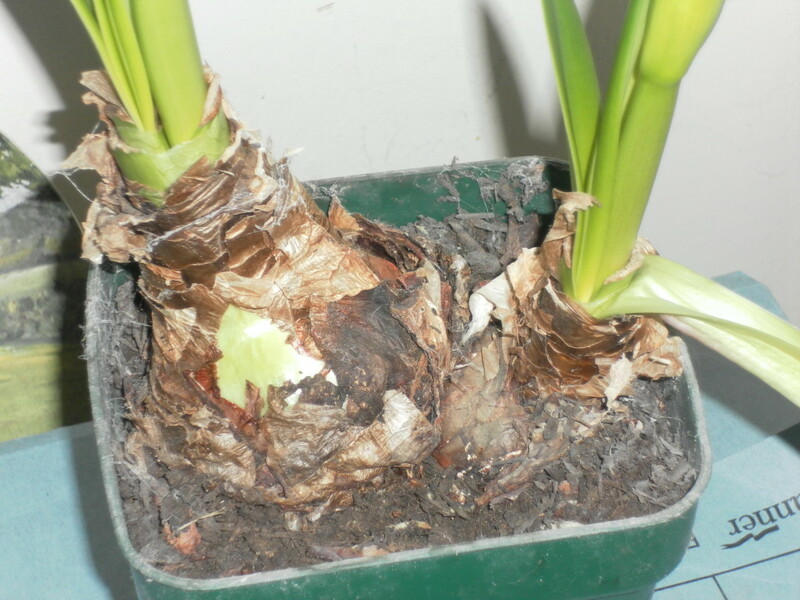 Hippeastrum which are still often known as amaryllis are probably the most common houseplants which grow from bulbs, but there are other species which are worth having a go with too. Depth – the tip of the bulb should be above the surface. Notes - I've found this to be very shy of flowering with flowers appearing every few years. Notes - feed every fortnight whilst the leaves are green to encourage flowering the following year. You can give any sort of bulb a try as a houseplant, but hyacinths and some of the early flowering daffodils are especially popular because they can be ‘forced’ to flower earlier than usual and provide flowers around Christmas and new year. 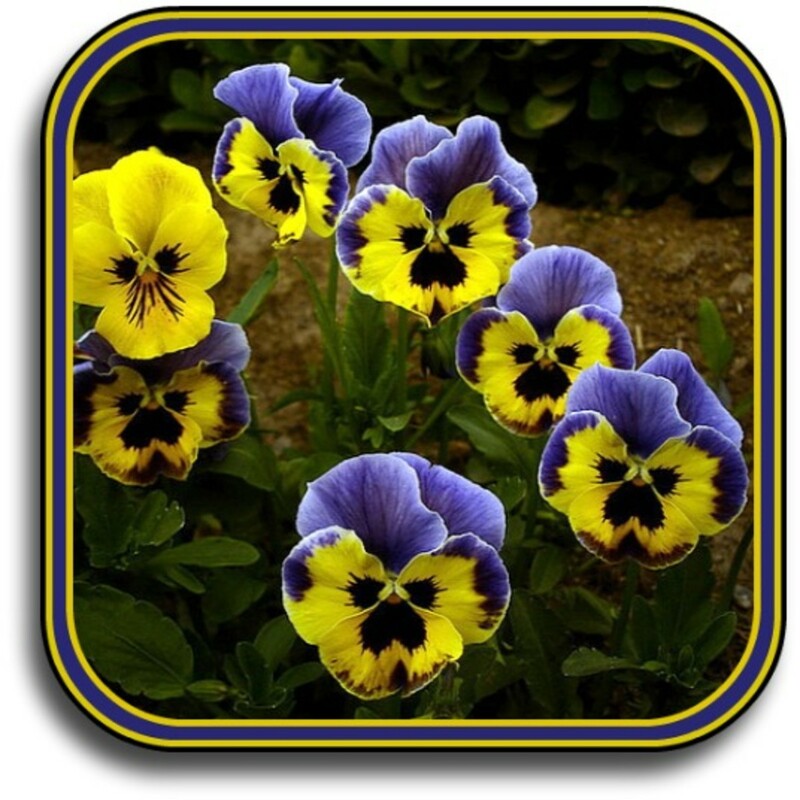 These get planted at a much shallower depth and closer together than you would in a garden container or flowerbed. 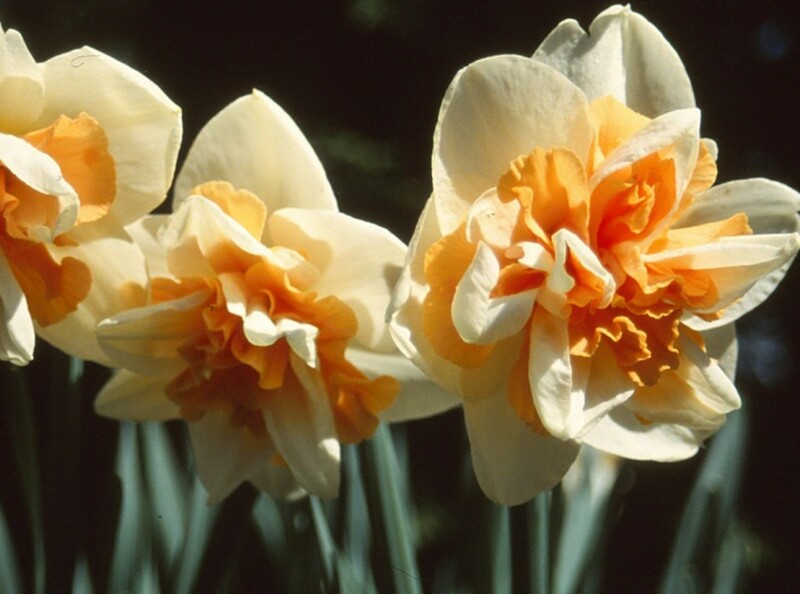 It is best to use the same species and colour of bulb in one pot, because they will be more likely to flower all at the same time. The ideal temperature is 4 - 9 centigrade (32 - 48 Fahrenheit). If you haven’t got a lot going on in your fridge, this is a perfect place. Realistically a cellar, cupboard in an outhouse or garage will do. If your cool place isn’t dark, put a black bag loosely over the pot. Put a 1 inch layer of moist compost in the bottom of the container. 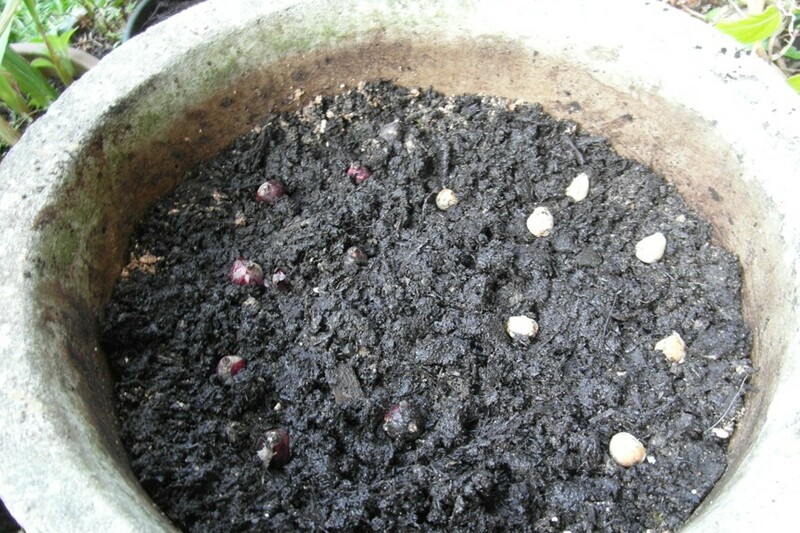 Place the bulbs on the compost, close to each other, but not touching. Cover with moist compost until just the bulb tips are showing. Put the pot somewhere cool and dark until they produce shoots. The length of time it takes to produce a shoot depends on the bulb species. Hyacinths usually take 8 weeks to produce a shoot. Bring the pot into a cool room away from the window for a couple of days. Place them on the windowsill until the buds are about to burst into flower. 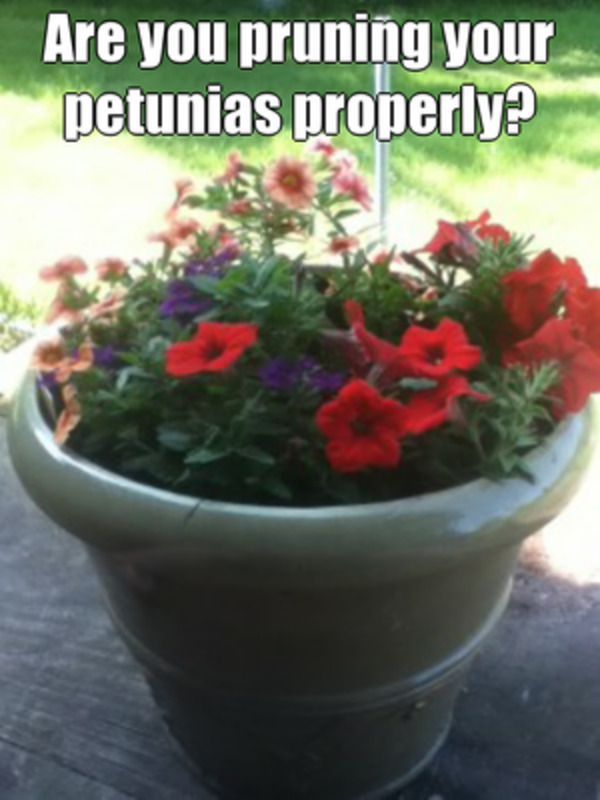 Move the pot to the flowering position where you will enjoy them most. After flowering some people allow the leaves to die down and then plant the bulbs outside in autumn, but because they have been grown in very little compost they won’t have stored enough energy to produce a good show the following year. 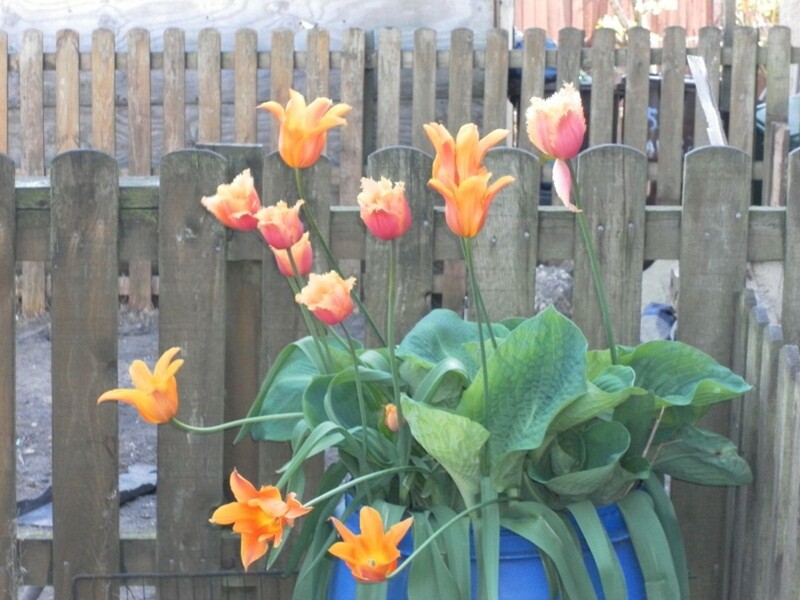 Alternatively you could treat them as annuals and throw away or compost the bulbs. The shallowest it is possible to plant hyacinths is in no soil at all! You can get special hyacinth glasses for this. Fill the bottom section of the glass with water. Sit your bulb in the top section with the bulb base just touching the water and then follow the steps above. 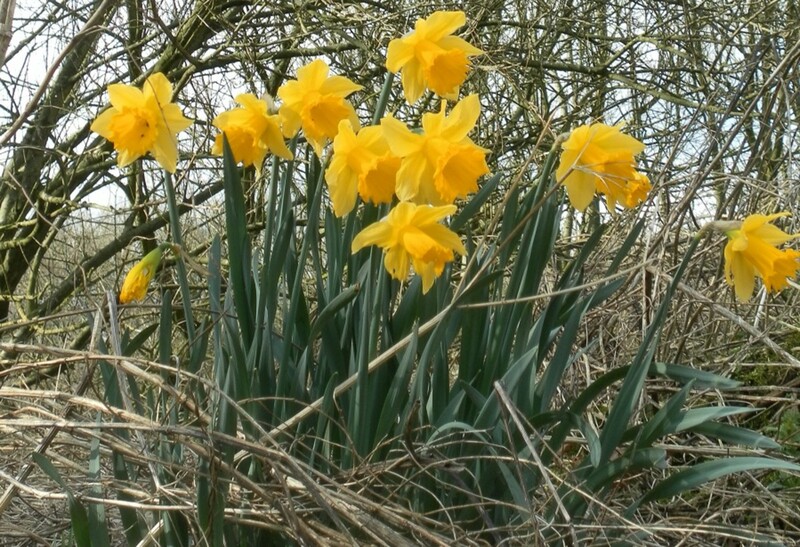 These bulbs will have not stored any energy after flowering, so it’s not really worth keeping them a second year. I'm delighted you found it useful Riviera Rose, you might find with your bulbs planted shallowly that they come up and flower well in the first year, but then come up blind in the second year. It seems to effect how much nutrients they store between flowering. I wish I'd seen this before I planted loads of bulbs last year - I looked out for information but now realise they're way too shallow. But...where I am we never get any frost so I might get away with it? A lot are beginning to show. Oh well, I'll let you know in spring! Great hub, one I'll bookmark and refer to in the future, thanks! Thank you for the share and pin Jill! Perfect resource and beautiful photos! Well, I guess I know where to come when I need to plant bulbs. Thanks for the great info and the nice photos. This is a great helpful hub, because bulbs refuse to come up for me so I've given up. Now I might try again. Thank you.